A Film by Peter Wilson. VHS Video:90 mins, produced 1995. 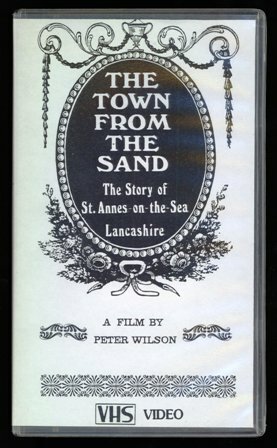 THE FILM "THE TOWN FROM THE SAND" WAS MADE IN 1974, SPECIALLY COMMISSIONED BY THE LATE MR. GABRIEL HARRISON, THEN CHAIRMAN OF THE ST. ANNES ON SEA LAND & BUILDING COMPANY, TO MARK THE TOWN'S CENTENARY IN 1974. IT IS A DOCUMENTARY FILM WHICH TRACES THE HISTORY OF ST. ANNES ON SEA, LANCASHIRE, FROM ITS FOUNDING IN 1874 TO THE PRESENT DAY. THE FILM RUNS FOR 90 MINUTES AND IS IN COLOUR. IT WAS MADE BY PETER WILSON, A FILM MAKER OF ST. ANNES ON SEA, WITH THE KIND ASSISTANCE OF MANY LOCAL PEOPLE WHO LENT OLD PHOTOGRAPHS, PAINTINGS AND DRAWINGS. MANY LOCAL DRAMA GROUPS ALSO HELPED TO RECONSTRUCT MANY EVENTS IN THE TOWN'S HISTORY. THE FILM "THE TOWN FROM THE SAND" HAD ITS PREMIERE AT THE DORCHESTER HOTEL IN LONDON IN 1974, FOLLOWED BY A NORTHERN PREMIERE AT STUDIO ONE CINEMA, ST. ANNES. BBC TELEVISION FILMED A "NATIONWIDE" REPORT DURING THE MAKING OF THE FILM, WHEN EXCERPTS FROM ','THE TOWN FROM THE SAND" WERE SCREENED. FILM WRITTEN, PHOTOGRAPHED AND DIRECTED BY PETER WILSON. BASED ON THE BOOK "RAGE OF SAND" BY GABRIEL HARRISON.COMMENTARY SPOKEN BY MALCOLM WILSON. SOUND BY ARNOLD SUMNER & DAVID WILSON. MAKE UP BY REGINALD F. HUGHES. FILM PROCESSING BY RANK FILM LABORATORIES. COPYRIGHT: GABRIEL HARRISON FOUNDATION TRUST 1974.